Thanks to all who were involved this evening. Was very funny. Auf den Feldern vor der Stadt hat sich um die Flamme eine feste Ablagerung von mit Asche verkrusteten Steinen gebildet. On the fields in front of the Town a solid deposit of ash-encrusted stones has formed around the flame. Someone write something under the Parchment. Should no Problem, you know my Work. I'll think about some designs and tell you so that you can decide which best suits your wish. Topic: Account activation email not received? Re: Account activation email not received? Did you look in your spam folder? Topic: Where have they gone? The Flame is not gone out. And they did not abandoned Runewick. And we still have the academic council which takes care of the affairs runewicks. Bearer of fire, brother of the dragon from Runewick. He still does not work in general. No matter what race and gender. So wie ich das mit bekommen habe tritt das nach Teleports und Treppenbugs gelegentlich auf. Sounds like you got up on the wrong foot. Maybe the pictures are just not that well chosen? and thats why no one write something here. What kind of movie do you mean? The one where Santa Claus goes shopping? I count 9 calls. Necromancy is considered by many magicians a forbidden, or proscribed, magic. agrees, I have not noticed that yet. I did also found a old magic gemstone. I'm not sure where I found him. Probably in a treasure hunt. 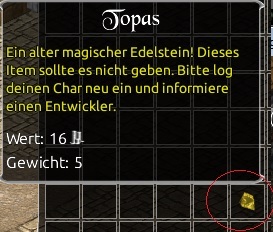 I only noticed it when I wanted to put the gems in my depot, that it is not a normal gemstone. Topic: Java instance schließt nicht nach "X"
Re: Java instance schließt nicht nach "X"